Posted by shawnpci in Fire Protection, Fire Systems, FSSA, Good Stuff to Share, Mass Notification Systems, NICET, PSA, Uncategorized. FSSA’s 34th meeting ls largest ever. The second day of the Fire Suppression Systems Association’s 34th annual meeting was highlighted by separate technical and business tracks for attendees. The business track featured understanding communication styles in business settings; planning for business transitions; and mitigating risk and loss in insurance and liability. Technical sessions included wireless technology & fire suppression; learning of fires in mission critical facilities; and fire protection strategies in air containment aisles. 28 companies have supporedt the FSSA 34th annual meeting with sponsorships of speakers, presentations, breaks, dinners and receptions. The meeting continues through Tuesday, February 23rd. Posted by shawnpci in Change Leadership, Fire Protection, Fire Systems, FSSA, Good Stuff to Share, NICET, PSA, Security Systems. Monday, February 1, 2016, marks the 50th anniversary of Protex Central, Inc. For these past 50 years, Protex Central has been providing life safety systems and services to customers throughout Nebraska and Iowa. With employees who are dedicated to providing the company’s core values through excellence, professionalism and integrity, Protex Central thrives in addressing key life safety and security issues for its customers. Protex Central service representatives are on call and available 24/7. Service technicians are well versed in the inspection, maintenance and repair of all types of life safety systems including fire suppression systems. All technicians are manufacturer trained, licensed, and certified. The company has become skilled at developing a turn-key plan to deliver the needed level of response so customers will know their people and property are protected around the clock with Protex’s sole mission plan in mind – To strengthen our business by protecting yours! By investing significant resources in the development of its professionals, Protex Central is uniquely positioned to best understand the needs of the industries it serves. Customers have come to know over these past 50 years that with Protex it’s the protection they pay for, but peace of mind is what they get. Posted by shawnpci in Change Leadership, Good Stuff to Share, Iowa Alarm Association, PSA, Security Systems. The SecurityXchange Conference serves leading integrators, end users and consultants who are seeking solutions for their upcoming projects. They identify innovative solution providers for executives of these large organizations to save them time building strategic relationships. The meeting is a two day event held at the Deer Lodge Resort in Park City, UT bringing together over 100 of the top executives from manufacturers, integrators, consultants and end-users in the security industry from around the country. Protex Central will be represented by it’s President and Chief Energy Officer, Shawn Mullen. The meetings start on August 13th and conclude on Wednesday, August 15th. Posted by shawnpci in Change Leadership, Fire Protection, Fire Systems, FSSA, Good Stuff to Share, Iowa Alarm Association, Mass Notification Systems, PSA, Security Systems. Protex Central, Inc. has been named a 17th annual SAMMY (Sales and Marketing) Award finalist for Installer Of The Year in the small to midsize company category by Security Sales and Integration magazine. 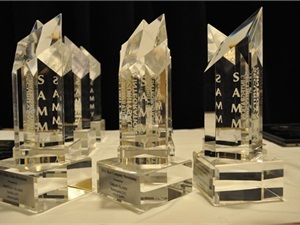 The SAMMY Awards is the industry’s only program of its kind to recognize and honor installing security dealers and integrators for their marketing, business, installation and overall excellence. Security Sales and Integration will announce the winners at an open awards ceremony in Las Vegas on March 27 — the eve of opening day at ISC West. ISC West is one of the premier security and systems integration industry gatherings. The event will be held at 4:30 p.m. in the Casanova Conference Room 502 at the Venetian Resort Hotel Casino. All are encouraged to attend. Mullen will attend the ceremony along with other Protex Central management representatives including, Chairman of the Board, Dennis Mullen; Executive Vice President and Chief Technology Officer, Brad Reiber; and Sr. Vice President – Operations, Scott Miner.